De Sales compares prayer to the shooting of an arrow “up to the heavens”. I would like to ask if we shoot our prayer up to God in Heaven, exactly what are we aiming at? His Heart perhaps? Imagine, if you will, a target in Heaven like that used by a common archer here below. We supplicants, weary and wayward as we are, shoot our prayer heavenward but the target seems to elude us – except that God hears our prayer before we say it and he sees that arrow before it is released. God moves that heavenly target so that it meets the arrow – your arrow – your prayer is mercifully heard by God, your prayer is lovingly received by God. God cheats sometimes because of our incapacity. What we lack He makes up for in Mercy. 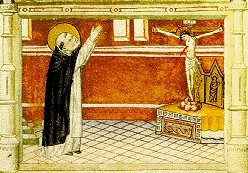 *Taken from the Nine Ways of Prayer – the Nine Ways of Prayer was written by an anonymous Bolognese author, sometime between A.D. 1260 and A.D. 1288, whose source of information was, among other followers of St. Dominic, Sister Cecilia of Bologna’s Monastery of St. Agnes. Sister Cecilia had been given the habit by St. Dominic himself. “The Nine Ways of Prayer” has been sometimes printed as a supplement to “The Life of St. Dominic” by Theodoric of Apoldia, though they aren’t an actual part of that work. Good posts, I enjoy reading St. Dominic & St. Francis de Sales. I am amazed at the consistency of the quality and substance of your postings. Keep up the excellent work and let us pray all the more fervently for the unborn during this election year. Thanks Father Peter – we highly recommend your blog too. It has so many great pro-life posts. I still haven’t figured out how to download videos. You have some really interesting videos on your blog.